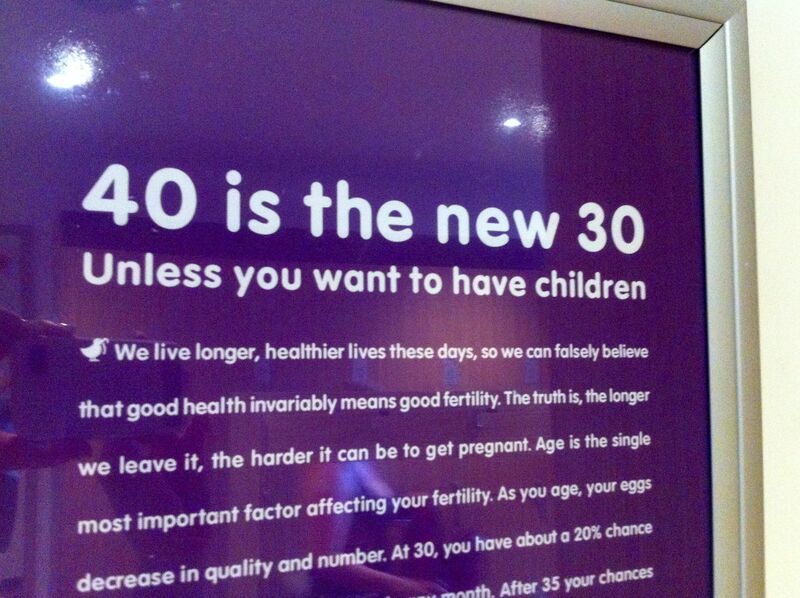 I’ve often run around proclaiming 40 to be the new 30 – more out of ageist vanity than anything else – so it was a slogan that very much caught the eye when I spotted it on the wall at the gym recently. The ladies room at the gym is a popular advertising spot and glancing around, I found a range of these ads covering most of the walls – apart from the odd deodorant campaign. Perhaps someone was listening because now the state and federal government health departments have combined forces to get the message across to women in the public domain. You see, when you get to my age, you find many women around you who weren’t given this message and now it’s too late. There used to be a common misconception that it was all good and dandy to easily fall pregnant in your forties, and that’s not the case. In fact, regardless of age, ten per cent of couples struggle with fertility. At 32, your fertility declines, and then after 35, your chances of conceiving fall dramatically. 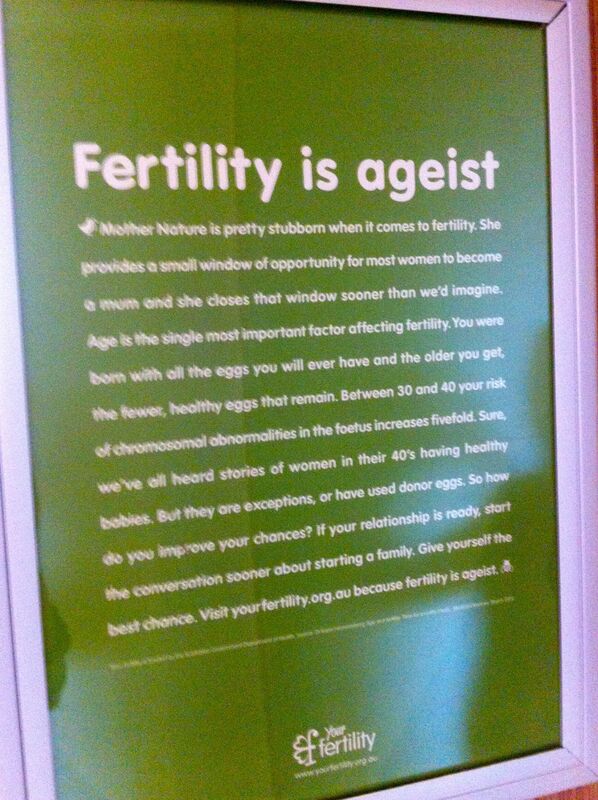 As the main poster message says – Fertility IS Ageist!! As I wrote earlier, I’m also well aware that this is a highly sensitive and complex issue. I don’t wish to offend anyone who is an older parent – if you’ve made it work – fantastic. I’m just saying – if you’re like I was in my late 20s and think you have all the time in the world – think again. Look up the statistics and decide whether it’s really worth waiting. And congratulations to our health authorities who are finally doing something about the issue. 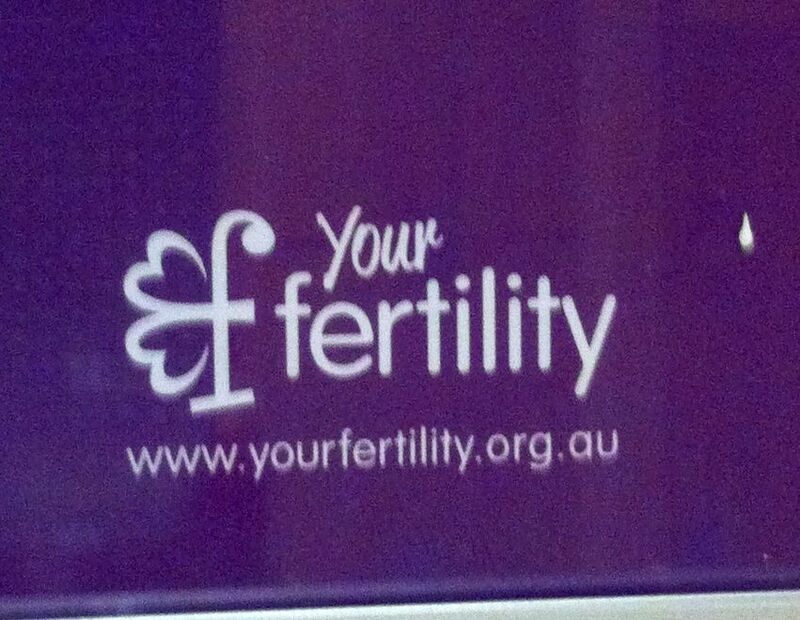 If you’d like to know more, just visit the fertility website. After all, babies are pretty fabulous. I’m lucky enough to have had two and wish everyone as much joy with parenting as ourselves.